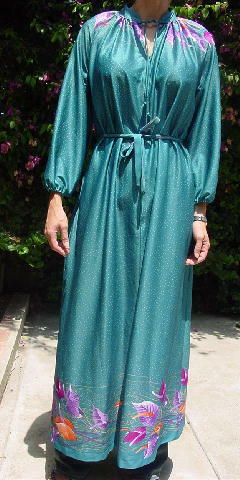 This vintage teal color loungewear is 80% triacetate and 20% nylon and was made in California. It has an 18 1/2" long front zipper. There are light yellow dots all over and flowers in white, orange, light and medium magenta, and light and medium purple. 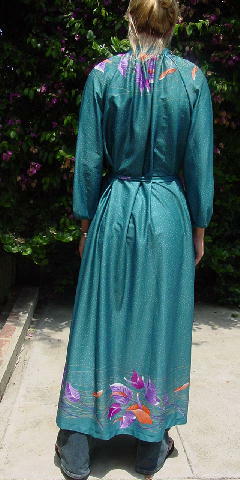 It has a band collar, a 4 1/2" open slit with 17" long ties, and raglan sleeves. There's loose elastic at the sleeve ends and it has side seam slit pockets. 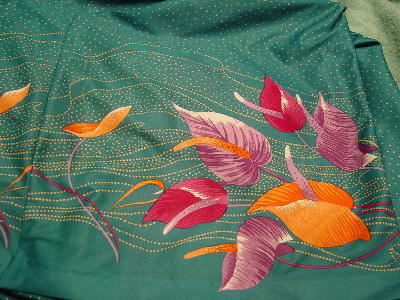 It has a 57 1/2" long by 7/8" wide double sided fabric matching tie belt. It can be worn with or without a belt. bottom hem side to side 31"
armpit to armpit 23 3/4"